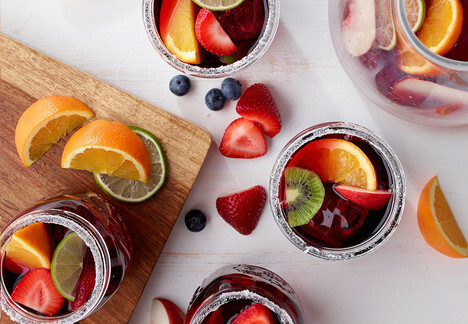 The refreshing Spanish punch you’ll love a bunch. Remove the frozen lime bars from the popsicle sticks by cutting around the sticks. In a blender, blend the sangria and frozen lime bars together until smooth. Meanwhile, on a plate, mix together the salt and sugar. To salt/sugar the rim of the glass, wet the lip of each glass with a wet paper towel and then rub the lip of the glass into the salt/sugar mix until a crust is created. Pour the SanGrita mix into salt/sugar-rimmed glass and garnish with strawberries and blueberries to taste.